Imagination TV, Inc (PL) (IMTV) CEO Mr. Steven M. Samblis has some priority issues. While his company’s stock languishes at .0001 (yes, that’s 3-zeros), hasn’t filed his financial reports in quite a while (is currently overdue, and sports a Yield Sign on the OTC website), and the company hasn’t reported ANY revenue in almost 2-years… and yet he justifies pledging stock shares for loans to pay legal costs associated with getting his name trademarked… and going after Friends for trademark infringement. What’s wrong with that picture ??? With priorities and decisions like these, it’s no wonder the company stock price is at .0001. Yes folks… according to Mr. Steven M. Samblis, he is still pursuing more legal action against Friends for using his name and graphic images of his websites. Recently, Mr. Steven M. Samblis has been corresponding with Larry regarding this issue. Apparently he didn’t get the message after the UDRP decision that he lost. Pursuing this issue seems to be paramount on his mind. Some say he is obsessed with the issue. Can you narcissistic ? Below is the email Mr. Steven M. Samblis sent regarding more legal action. And of course you know who is footing the bill… investors. (see the full exchange here, here, and here) – It is certainly worth your time, and will make understanding this post a lot easier). If you’ve followed the above links, you will see that in spite of me trying to draw Mr. Samblis’s focus to those questions… he doesn’t even acknowledge them. We think that speaks volumes about what’s going on here. There are those who say (and have always said) that Mr. Samblis simply uses his company as a share-selling vehicle. They go on to say that Mr. Samblis uses whatever may be the flavor of the month as a front to sell more shares (i.e. videos, TV station, website, etc). We think, this issue of copyright infringement uncovers and exposes Mr. Samblis’s true intent. Consider this… Mr. Samblis is “currently” engaged in the selling of motivational videos. Why would anyone engaged in selling videos care about what is said on this blog, or any other blog/message board? Consumers wanting to buy his videos are not looking up information on the owner of the company – they just want a video. It’s a simple transaction… they want a video, he has it, they buy it. They could care less if the CEO is a dirt-bag or not. However… if what they say is true, his primary product is company shares… then if you want to stay in THAT business, you need to shut up your critics. In business, CEO’s usually invest the most in what brings in the highest return on investment. With Mr. Samblis it appears to be selling shares. So… read through the email exchange and decide for yourself what you think is going on here. 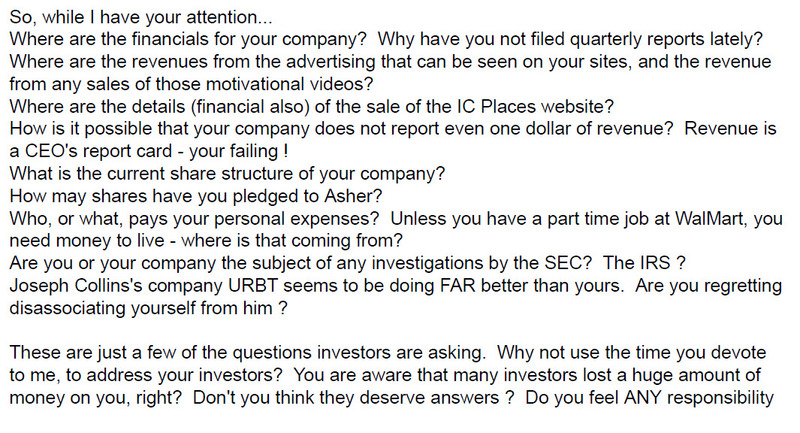 If you are still an investor, consider also what the CEO is spending your hard earned invested dollars for. If the CEO, Mr. Steven M. Samblis is making decisions like you see here, consider what other decisions he may be making with YOUR money. We think he decisions are in direct relationship to the share price, and, the interest in buying any of those shares. Hello folks. Just when you thought it was safe to go back in the water… a dorsal fin has been spotted. Yes… Mr. Samblis is still around, and still surfing our sites. HOW do we know this… see below the exchange Mr. Samblis had with Friends over some images on our sites, and his mug-shot photo. Now, the application has not been approved yet, and in our opinion it’s unlikely it will, but that hasn’t stopped Mr. Samblis from taking actions as though it were already approved. Sort of like his press releases… he seems to believe that if he thinks it, it is real. One only needs to look no farther then the success of his press release info to forecast the future of the Samblis name being trademarked. Back to the contact by Mr. Samblis. The graphic below is the email we received from Mr. Samblis. Notice how he insists his name is trademarked. Well here is the actual application, and status. 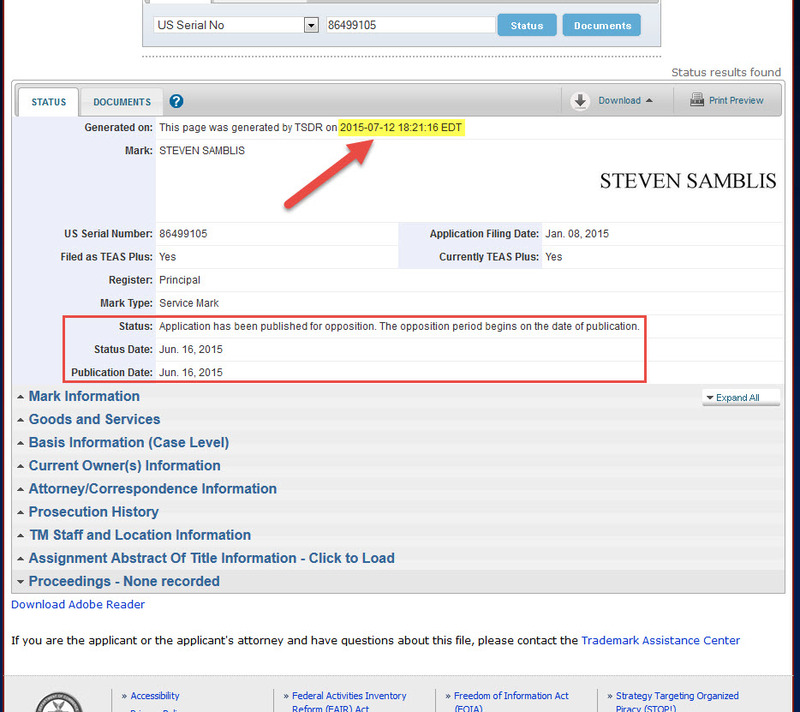 As you can see… the status is pending (pending public comment in opposition to granting approval). Also take note that the picture of him he refers to is the mug-shot picture. Mr. Samblis appears to take a position that since it’s a picture of him – it’s copyrighted. Someone should tell Mr. Samblis that the picture was taken by law enforcement, and as such was paid for by tax dollars, and therefore belongs to the public. Additionally, as they say, once on the Internet – always on the Internet. HERE is a Google cached copy of the page. You may notice, Mr. Samblis has been busy trying to erase his past, and, silence his critics (Friends). Mr. Samblis has apparently successfully had the reproduction of the page deleted by Investors Hub, and also from MugShots.com as well as Arrets.com. However… the page lives on, and copies are available should Google decide to delete the cached page. Yes… a real role model for CEO’s worldwide ! So much so his name needs to be copyrighted ! Folks… you just can’t make this stuff up. It’s just amazing what one man can do with millions of other people’s money and an attitude, and aptitude, like Mr. Steven Samblis.